4 months. That’s how long it has been since I last posted. As I completed another round of folk school catalog design this week and went to delete “Annie writes a blog called Drift Less, Learn More” from my bio, I decided to instead actually take up writing again. As there is no way I could possibly write an update on everything I have done in the past 4 months, here is a “brief” slideshow of events instead. Enjoy and come back soon for more updates! This weekend Jamie and I went to the North Central Biodynamics Gathering and since then my mind has been buzzing with dreams for the future. The gathering itself was really interesting. I got to hang out with a Warren Wilson person I hadn’t seen since graduation and there was a lot of good food for thought– and my tummy. Biodynamics is still quite mystical to me. I don’t fully understand what it is or how it works and the gathering definitely wasn’t set up to explain any of that– it was more philosophical. In California I used Biodynamic preps for compost starter and compost tea but until I do some serious research it is going to be mystery. 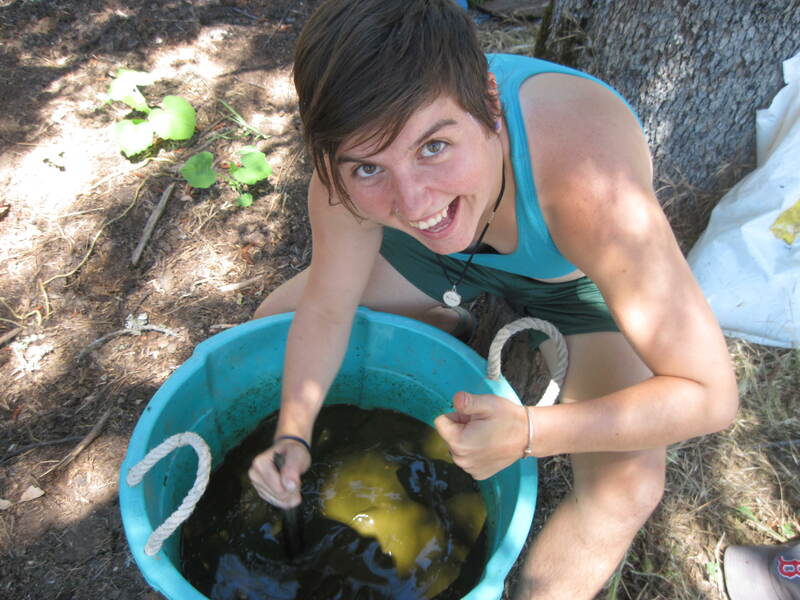 Below is a picture of me stirring some compost starter and water in summer 2010. I affectionately called it poop soup. It made our compost piles shrink a lot faster than the piles we didn’t add it to. Magic! One thing I did like about the gathering was listening to Craig Holdredge speak about Goetheian observation and how we can relate it to agriculture. Going to gatherings and conferences like this one always leave me wanting more. I love the community feel and all the gained friends and connections. Jamie and I are currently on the look out for some land and a house to rent so that we can grow a whole bunch of food, raise chickens, and hold folk school classes. We have both done a bunch of farm, garden, and homestead like internships and apprenticeships and we know we don’t want another one but finding a decent place that is affordable is tricky. Plus since I don’t drive I would prefer to be within biking distance to town. Living in town generally means more expensive house with less land but close to all the action and community activities. Living out of town means more land, possibly less expensive, less towny noise, and most likely transportation issues. I dream of having a tiny CSA or at least a farmers market booth but is that a dream for this year? Do we have enough money? I feel an urgency when I think about all this. And not just because I have to move out of my cabin soon. It just feels like the time is now and I am ready. Anyone out there in internet land know of a good place in or around Viroqua? In the past week or so Jamie and I harvested all the hops! They are now dried and in large food grade buckets awaiting their destiny of being made into yummy beer! After saying that I would update more frequently I promptly left home and didn’t update. Sorry folks! Jamie and I took a trip up to Superior country for a few days. It was wonderful. The lake and surrounding area are gorgeous. I really enjoyed seeing Ashland and Northland College as I had thought about going there way back when during college application times in high school. One night when we were camping I heard some crazy wildlife that I am unfamiliar with and haven’t been able to identify. I also heard WOLVES! On Friday night the What Cheer? Brigade took our little town by storm and it was a dance party extravaganza never to be forgotten. Pretty much everyone I knew or have ever seen in town was there and dancing and having a blast. Not many bands come to Viroqua and it was great to see everyone out and having fun! I love this community! A full update with photos will follow this but let me just say that I made a knife and its awesome! I’ve never done any blacksmithing or forge work before and I really loved it! More later. We recently got a half bushel of peaches and I have been preserving them in various ways all day. I have some peach rings and fruit leather in the dehydrator right now and I am mid-canning some in a light syrup. Unfortunately the propane tank ran out and I must wait for the new one to get here this evening until I can finish! We harvested the garlic a couple weeks ago, tied it, hung it in the barn to dry, and yesterday I cut it down, cleaned it, and prepared it for storage! It’s fun to see the whole process and it smells oh so yummy! More to come and don’t worry, there will be pictures! Growing out of some old compost are a ton of volunteer squashes. 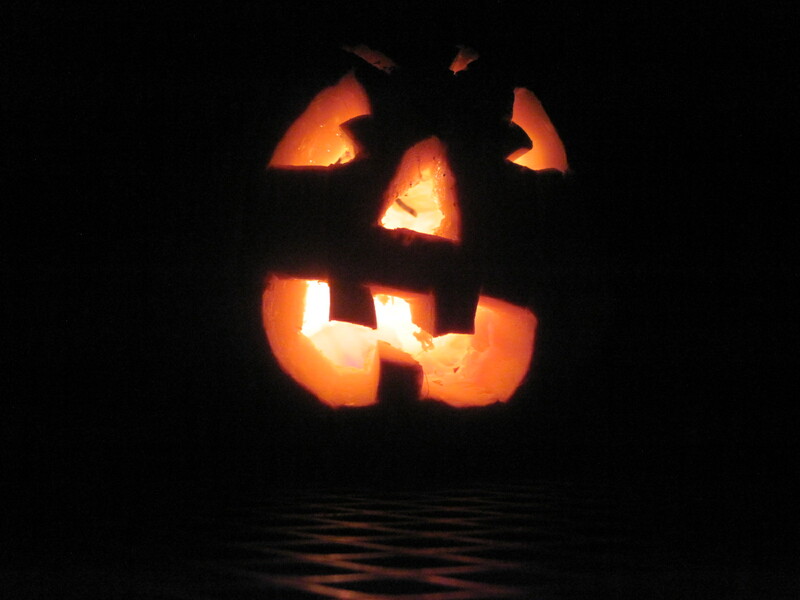 To celebrate the beginning of August I harvested a pumpkin and made a special Jack-o-lantern! The farm where I live has 3 horses, 2 goats, a couple dozen chickens, 6 cows, 2 dogs, 2 cats, and a ton of wildlife. 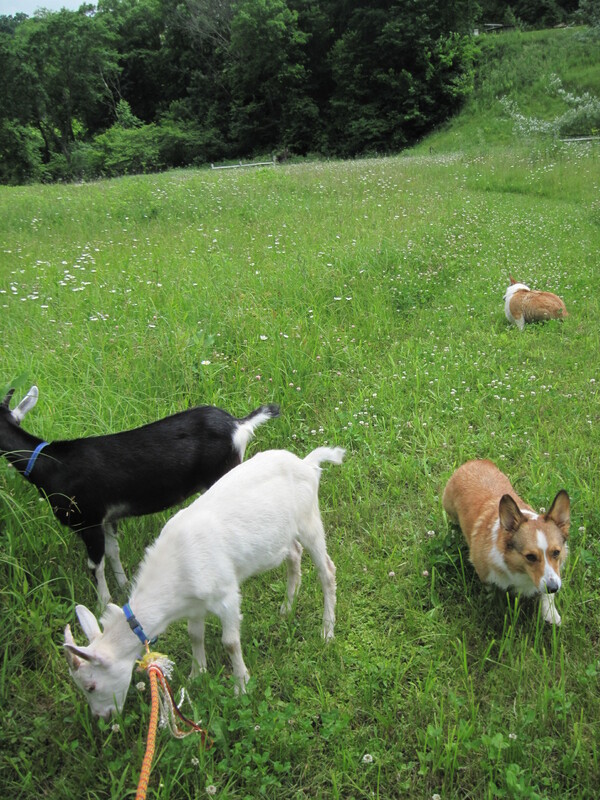 The dogs, Freddie and Dolly, and the goats, Abe and Lily, are my favorites. One day while everyone else was out I decide to go on a hike with all my special friends. I put Abe on a leash and everyone else just followed. We went to the creek, through the woods, up the driveway, and all around the pastures. What a grand adventure! My name is Annie B. and I am a 23 year old college graduate doing what many of my peers are doing in this economic climate—traveling, doing internships and work-trades for little or no money, and blogging about it! 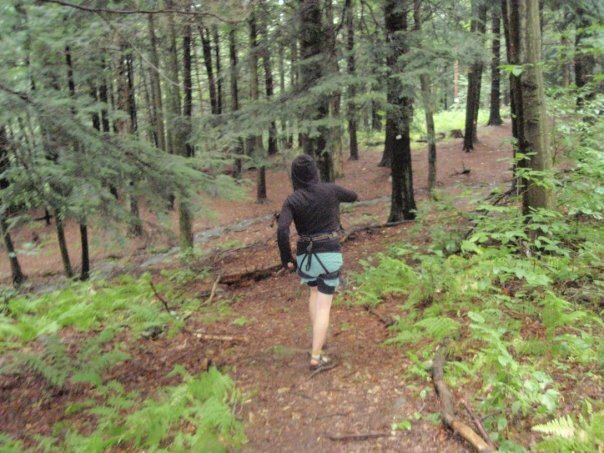 Growing up in Massachusetts, spending summers at camp all around the Northeast, and going to college in North Carolina has all contributed to my current state of wandering and I couldn’t be happier with all the experiences I’ve had. After graduating from college with a degree in Outdoor Leadership Studies I stayed on campus as a Resident Director where my duties mostly included planning under attended events for my residents and writing up or lecturing loud underage drinkers. I then moved to California for a year-long position as a Community Intern for the Woolman Semester—a radical semester program for high school juniors, seniors and gap year students based on peace, sustainablility, and social justice. As an intern I wore many hats including: “grown-up”, gardener, vegetarian chef, trip leader, nanny, camp specialist, chaperone, etc. and loved them all. Now my wanderlust has pulled me to Southwestern Wisconsin where I am a work/study for the Driftless Folk School. 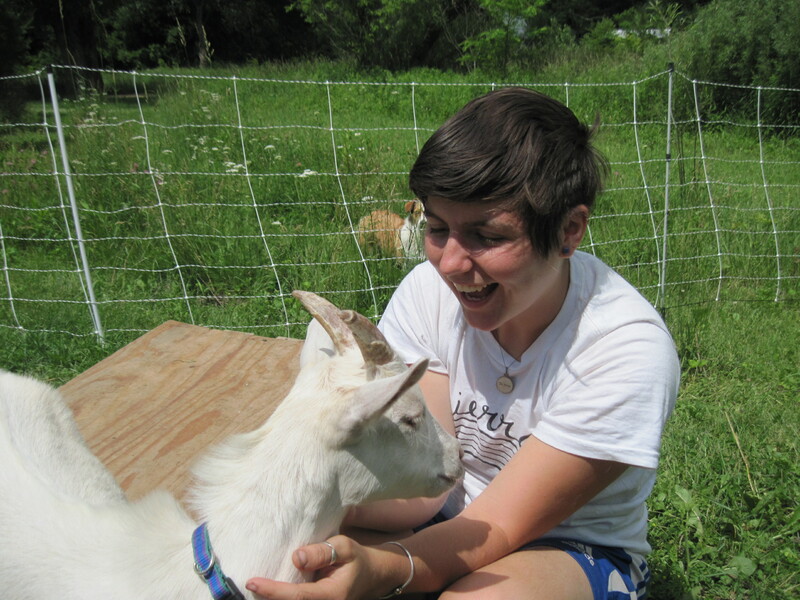 Driftless Folk School is a community based program focused on sharing knowledge, skills, and passion related to sustainable living. The school has no physical location and classes are held at various homes, schools, farms, and homesteads around Viroqua and Vernon County. Classes are signed up for individually so that a person can take as many as they want throughout the year. Local experts and enthusiasts are hired to teach skills like pickling, natural building, chicken butchering, cheesemaking, blacksmithing, etc. As a work/study I live with a host family on their farm outside of town where I work for room and board and a couple hours per week for the Folk School itself for a small stipend and free Folk School classes. The folks I am living with out at Turtle Hollow are absolutely fantastic and I feel so lucky to have this opportunity! My goal for this blog is to make it appealing to family and friends as well as those interested in Driftless Folk School, folk schools in general, or farm/rural life. I feel I should mention that each work/study lives a very different life depending on what their host farm is like so it would be impossible to represent each experience in my blog. I’ll just keep to what I know! To follow will surely be photos, recipes, anecdotes, class reviews, and whatever else spills out of my brain. Enjoy!